When I first got into IT after the army my boss at the time was big into Linux… which didn’t bother me at all, because I wasn’t really ‘in to’ anything. I certainly knew Windows better than I knew Linux, but I was just happy to be there. There was one concept that I had the hardest time understanding, and that was virtual desktops. It didn’t come up very often, but when it did (especially at one particular customer) he would show it to me… but it took me the longest time to finally understand… we were working on the same computer, and the prompt (bash) looked the same… but when we pressed that magic key combination we were all of a sudden working in a completely segregated memory space; so if we had a process running on Desktop 1, we could port into Desktop 2 and continue working. I really just didn’t get it. I finally got it of course… I never really used them much beyond that though, because I left Saturnus and spent most of the next twenty years working with Microsoft technologies… and of course Microsoft did not have Virtual Desktops. Of course they probably had a decent rationale… with Windows you did not actually need to segregate desktops because you could run multiple applications simultaneously, and just minimize the ones you weren’t using. I suppose that made sense… but when Linux implemented a GUI and they still had virtual desktops (I specifically remember seeing a Novell implementation of it) even with the ability to minimize apps. Well guess what… they do now! In Windows 10 Microsoft has implemented a new technology that the Linux world has been using since at least the mid-1990s. I can now, on the same computer (logged on as a single user) segregate what I am doing between desktops… in other words, I can have all of the applications I run for my personal use – say, blogging and Internet banking – running on a single desktop, and have all of my work applications – say, e-mail, Excel, and Hyper-V – running on a separate desktop. This all sounds good… and I like how it works. It took me a few minutes of playing with it to figure out how to have two instances of the same program (say, Microsoft Office Word 2013) running on separate desktops. It does work, but it’s a bit of a workaround. Stop talking and show us how! To create a new virtual desktop simply click Ctrl + WinKey + D (Get it? New Desktop). Alternately you can open the Task viewer and click the New Desktop icon in the bottom right corner (see screenshot). Switching between desktops is also pretty simple. From the keyboard simply hit Ctrl + Winkey + left-arrow or right-arrow. (I would have loved to be able to set different desktop wallpapers for each virtual desktop, but so far I haven’t figured that out). To move a running app between virtual desktops, open the Task view, then right-click on the app you want to move. As you see, you will have the option to either close it or move it to another existing or new desktop. Okay, this is all very nice functionality… but is it really new to Windows? If you are a regular reader of this blog you probably know a thing or two about SysInternals (https://technet.microsoft.com/en-ca/sysinternals). There has been a SysInternals tool called Desktops (https://technet.microsoft.com/en-ca/sysinternals) for several years that does exactly this. So is it really new? Or is it another case of Microsoft saying ‘Okay, we have this new OS… what can we add in to make it look better, without spending a lot of time coming up with something new?’ Don’t get me wrong, I like the functionality… but to call it New is kinda pushing it. Linux (free) has had it since 1995, SysInternals (also free) since 2010… and now it’s in Windows so we should be excited. Okay, I’ll get right on that… tomorrow. 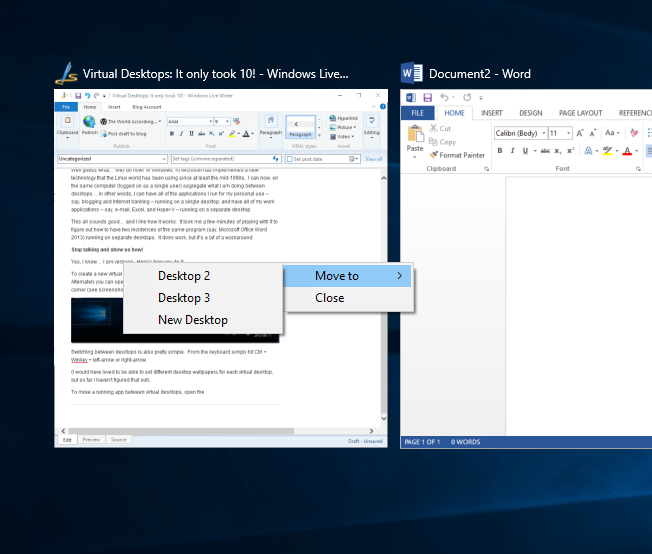 Don’t get me wrong… I like Windows 10, and I like Virtual Desktops. But calling them a new feature is pushing it a little. Next thing you know they will include BGInfo and ZoomIt in Windows 10.1 and we will all be expected to jump up and down. You see things faster than most people. I always learn things from you. When you come to a Metpro meeting, please tell us.